McKinney et al  report that more than half the published articles that apply Fisher’s exact test do so improperly. Our own survey of some 50 biological and medical journals supports their findings. This chapter provides you with a positive prescription for the successful application and publication of the results of resampling procedures. First, we consider the rules you must follow to ensure that your data can be analyzed by statistical and permutation methods. 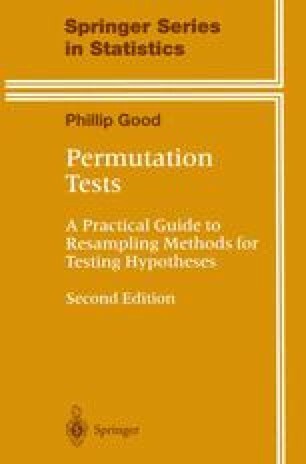 Then, we describe two commercially available computer programs that can perform a wide variety of permutation analyses. Finally, we provide you with five simple rules to prepare your report for publication.